I have one great thing to say about this cereal... what a pretty box! And that's where the complements end. At the very least, I was hoping this cereal would taste similar to Cookie Crisp... thinking it might be like mixing Vanilla Wafer Cookie Crisp with Chocolate Chip Cookie Crisp. It's not. The flavor is a bit confusing for the first couple spoonfuls. You get a minor sense of cookies and cream, but you also get phantom notes of peanut butter and malt. It starts as a mishmash of flavor and then, midway-through the bowl, settles into a dull general sweetness with lazy nod to a chocolate chip cookie. 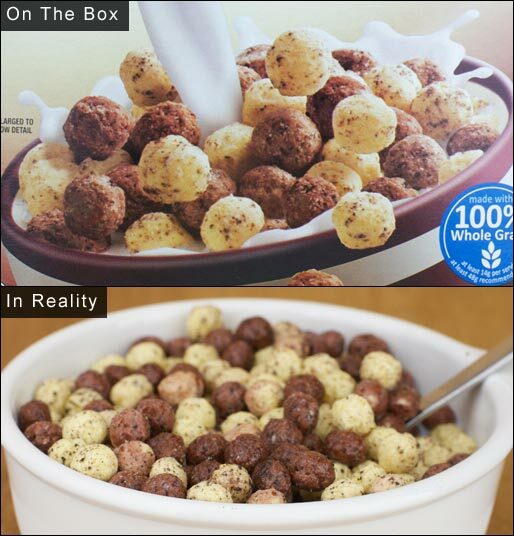 The cereal pieces are quite a bit smaller than they appear on the box. They're crunchy for about two minutes. Three minutes into it, some are crunchy and some are not. Five minutes into it, the texture begins to get gummy. If you try this cereal, pour small bowls and eat them quickly. 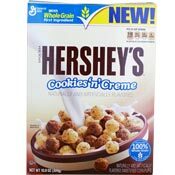 Sadly, this cereal does a disservice to the good name of Hershey's. There's very little chocolate flavor and it won't remind you of Hershey's awesome cookies 'n' cream candy bar. I might be coming down a little hard on this one because I expect a certain amount of quality from a Hershey's product. Because of that possible bias, I'm adding one Golden Egg to a dismal rating of 2 Golden Eggs. I do not recommend this product. Nutritional Considerations: Each 3/4 cup serving has 110 calories, 3 grams total fat (0.5 saturated and 0 trans), 0mg cholesterol, 125mg sodium, 21 grams total carbs, 1 gram dietary fiber, 9 grams sugar and 1 gram protein. What do you think of Hershey's Cookies 'n' Cream? I love this cereal. Please keep producing this cereal. I am not eating any other cereals. 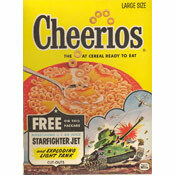 My grandson loves this cereal but I can no longer find it for him. I wanted more from this cereal as well! I love it. Tastes like cookies! Go cookies! LOVE IT!! Tastes like Cookie Crisp to me! Couldn't agree more. What a disappointment!